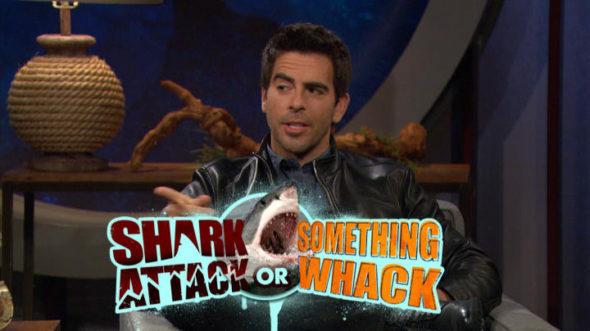 Eli Roth returns for more “shark n’ awe.” The director/producer/writer/actor will host the fourth season of Discovery‘s Shark After Dark late night TV talk show. Season four of Shark After Dark debuts Sunday, June 26 to Thursday, June 30, at 11:00pm ET/PT, on Discovery. Get the details from Discovery. (Los Angeles, Calif.) – Eli Roth is back for more shark n’ awe. The award-winning film director, producer, writer and actor (“Inglourious Basterds”, “The Green Inferno,” and “Knock Knock”, amongst other projects) returns as host of SHARK WEEK’s hit late-night talk show Shark After Dark for a second year in a row. SHARK WEEK, television’s longest running and most anticipated summer event kicks off Sunday, June 26, and for five consecutive nights, Roth will bring his unique style to Shark After Dark and make his mark on SHARK WEEK with celebrity guests, shark fans and shark experts, among many others. Additionally, Roth will look back at some of the highlights from SHARK WEEK and look ahead to give viewers a sneak peek at the next day’s SHARK WEEK programs. Produced by Embassy Row, Shark After Dark airs Sunday, June 26 to Thursday, June 30 (11:00-11:30 PM ET/PT) on Discovery. This year, Roth will also return as host of hour-long special, Shark Week Sharktactular. In this official countdown to SHARK WEEK, Roth will introduce viewers to the greatest sharks in SHARK WEEK history, fan-submitted viral videos and exclusive sneak peeks of the most jaw-dropping moments that will be featured on this year’s SHARK WEEK. Roth wrote, directed, and produced the horror films “Cabin Fever”, “Hostel” and “Hostel: Part II”, and as an actor, co-starred in Quentin Tarantino’s “Inglorious Basterds”. His producing credits include “The Last Exorcism” and “The Man With The Iron Fists”, and he served as Executive Producer on the hit Netflix series “Hemlock Grove“. Most recently, Roth co-wrote and directed the upcoming feature film “The Green Inferno” as well as “Knock Knock” starring Keanu Reeves. In 2015, Shark After Dark ranked No. 1 in its basic cable time period across all 25-54s. Additionally, last year’s Shark After Dark grew year-to-year across most key measures (P25-54: +13%) and saw its best ratings yet across key demos including P25-54, P/W18-49, W18-34 and HH. Discovery Communications (Nasdaq: DISCA, DISCB, DISCK) is the leader in global entertainment reaching 3 billion cumulative subscribers in more than 220 countries and territories. Discovery satisfies curiosity, entertains and inspires viewers with high-quality content through global brands, led by Discovery Channel, TLC, Investigation Discovery, Animal Planet, Science and Turbo/Velocity, as well as U.S. joint venture network OWN: Oprah Winfrey Network, and through the Discovery Digital Networks portfolio, including Seeker and SourceFed. Discovery owns Eurosport, the leading pan-regional sports entertainment destination across Europe and Asia-Pacific. Discovery also is a leading provider of educational products and services to schools, including an award-winning series of K-12 digital textbooks, through Discovery Education. For more information, please visit www.discoverycommunications.com. Part of Sony Pictures Television, Embassy Row is a television and digital production company dedicated to the development and acquisition of original non-scripted programming for broadcast, cable and digital platforms in the U.S. and abroad. The New York City-based company specializes in several genres including talk, games, competition, comedy, factual, food and sports. A pioneer in the areas of brand and social media integration, Embassy Row boasts a portfolio of popular and buzz-worthy series including “Watch What Happens Live” for Bravo; “Cutthroat Kitchen” for Food Network; “The Talking Dead” for AMC; as well as “Comedians In Cars Getting Coffee,” starring Jerry Seinfeld, for Crackle. What do you think? Are you a fan of the Shark After Dark TV show? Will you be tuning in? More about: Shark After Dark, Shark After Dark: canceled or renewed?